Until 1999 sales were reported at <i>Estimated Retail</i>. This is approximately 32% higher than actual sales revenues from sales made to Amway distributors. Amway global sales were reported at estimated retail until 2000 when the holding company of Alticor was formed. Alticor reported sales are for actual revenue. 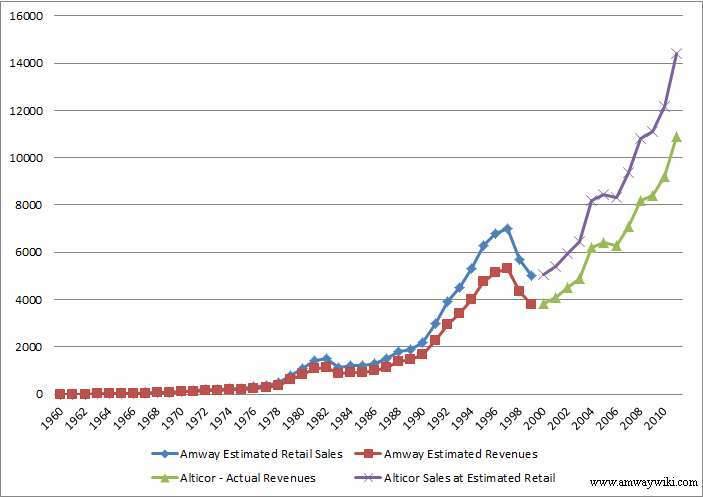 In the graph below estimates of Amway actual sales and Alticor estimated retail sales are included for comparison purposes. Note that Alticor sales includes revenues from other sources such Access Business Group and Amway Grand Plaza. Sales are reported in USD millions.